The link arm can be mounted in two different positions depending on your application. A lot of Enduro riders using the computer prefer the stabilizer to be mounted opposite of the standard position in order to accommodate an area for the computer. The Link Arm Puller allows you to remove and replace the link arm without damage to the seal area on the bottom of the stabilizer. 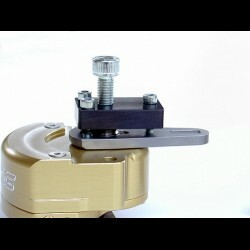 The Puller is also essential for those of you who plan to service your stabilizer yourselves.